A mostly-clean quest in a whimsical land, containing fairytale magic and bloodless violence. Dorothy and Uncle Henry encounter a terrible storm while sailing, and Dorothy is swept away once again to a magical kingdom. In the company of friends both new and old, she finds herself on a quest deep underground, seeking lost royalty. Magic is common in the world of Oz, and religion is largely ignored. Kindness and loyalty to one’s friends are upheld and rewarded. Bad guys lie and risk or threaten lives. A ruler is vain and irresponsible, and her behavior is seen as a bad thing, but not unequivocally condemned. The book has its ups and downs and gray areas, but as a rule it seems to be more interested in telling a fun story than in presenting complicated ethical scenarios or forcing an agenda. Magic is common in both Oz and Ev. It is given credit for anything which seems unnatural, including making full meals grow on trees and transforming a farm chicken into a talking chicken. Ozma can use magic by means of her nature as a fairy. Other people can use magic if they are wearing or holding a magical item or artifact. Various characters, including the young heroine, are menaced by various sorts of potentially dangerous creatures, almost stepped upon by an enormous automaton, and charged at by persons with spears. Many characters are temporarily transformed into inanimate objects. None of the main characters experience real injuries. A person is threatened with beheading, which, given the nature of magical lands in the Oz universe, might not actually mean death; another character has a number of heads which she keeps in a dressing room and switches out on a regular basis. In the past, a background character committed suicide by drowning. During her adventure, Dorothy is presumed dead by those she left behind. Some persons have things which are, to them, poison hurled at them to keep them at a safe distance from characters they may otherwise harm. A talking tiger has a craving for the taste of human baby, although he knows better than to act on it. A woman punches her husband because he doesn’t do what she wants. None. A common food is poisonous to another species. None. The villain begins spouting nonsense when he is angry. Ozma of Oz is a bit hard to place. It is strange and whimsical and self-aware, but for the most part it seems to be trying to be a serious story, not a humorous one. Characters are often in all sorts of danger, but even when I was a child I can’t remember it having been the sort of danger which frightened me. It is not a picture-book, but it is the sort of old children’s chapter-book which is delightfully sprinkled with black-and-white illustrations at almost every opportunity. 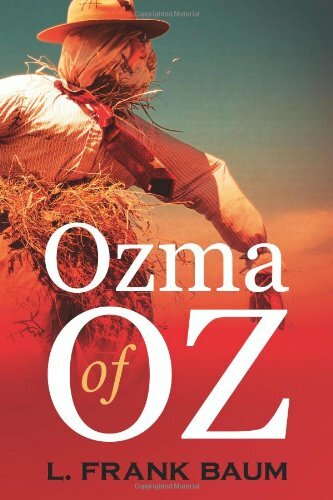 To use the words of the author’s foreword, it is “real Ozzy.” Whether or not that is a good thing probably depends on the reader. This review is brought to you by Lily A..
Read more reviews by Lily A.